Mayor Teresa Jacobs and members of Orange County’s Domestic Violence Commission recently presented key findings on the region’s State of Child Abuse during National Child Abuse Prevention Month, commemorated nationally in April. 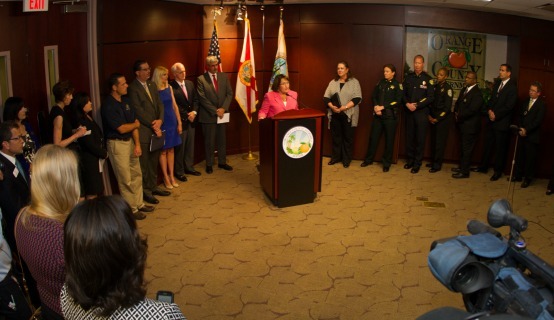 Out of 67 Florida counties, Orange County has recorded the second highest number of abuse reports with 13,855 cases. Additionally, within the first three months of the calendar year, eight children lost their lives in Orange County due to alleged abuse and possible neglect. As part of the region’s advocacy efforts and because of the close connection between domestic violence and child abuse, Mayor Jacobs called for the renaming of the Orange County Domestic Violence Commission to the Domestic Violence and Child Abuse Commission. The Commission has expanded its membership to include community leaders with expertise in the field of child abuse prevention. “We cannot ignore the fact that 80 percent of battered women also have children in the same situation, or the tragic consequences for so many of these women and children,” Orange County Mayor Teresa Jacobs said. Members of the Orange County Domestic Violence and Child Abuse Commission will continue the vital work of the DVC while also working to protect the County’s most vulnerable—our children. In early 2015, the Commission helped spearhead new, critical domestic violence legislation. Marie Martinez, operations manager for The Howard Phillips Center for Children & Families, said poverty, domestic violence, substance abuse, foreclosures and homelessness can potentially create an environment that is dangerous for children. For information about Orange County’s Domestic Violence and Child Abuses Commission, visit Domestic Violence and Child Abuse Commission. A collection of photos from the Domestic Violence and Child Abuse Commission News Conference are available for use by the media and are located on Flickr.